The 2013 Toyota RAV4 is completely redesigned for this model year, losing a bit in the process (V6 engine no longer offered and third-row seating is a thing of the past) but the five-passenger compact crossover gains attractive styling, more interior room and storage capacity, higher-quality materials, and more standard features. While some of the competition may have more powerful engines, offer better fuel economy and are more fun to drive, the 2013 Toyota RAV4 has stepped up its game with the redesign and is sure to capture the attention of buyers in search of a compact crossover. Echoing the thoughts of many in the motoring press, Car and Driver finds that the long-awaited redesign of the popular Toyota RAV4 "brings modern styling and a fresh, feature-laden cabin for 2013." What isn't so high on Car and Driver's list, though, is the absence of the old model's optional V-6 engine. Also missing from the redesigned RAV4 is the third-row seat. That and the V6 engine were what set the RAV4 apart from the competition. But, as Consumer Guide notes, the new RAV4 has "large dimensions that allow for great passenger and cargo room." Furthermore, the high levels of equipment and Toyota's strong brand reputation are reasons why the RAV4 is "well worth a look." While it doesn't have the most powerful engine, the best fuel economy or the lowest price in the segment, say the editors at Kelley Blue Book, consumers looking for a smaller, well-equipped SUV that seats five and gets good fuel economy will find it "hard to ignore the RAV4." In a full test of the 2013 Toyota RAV4, Edmunds found that even though it's not the most frugal compact SUV around, it is among the best in almost every other category: "comfortable with a full load of passengers," has plenty of cargo space sans passengers, and "delivers predictable, if tepid, performance no matter what's onboard." Summing it up, Autoweek puts it quite succinctly, saying that the 2013 Toyota RAV4 will win over customers with its reliability, competitive pricing, and "characterful styling." As popular as the Toyota RAV4 has been in the marketplace, the all-new 2013 RAV4 garners its share of owner accolades and a few gripes. For the most part, a review of owner sentiments on such sites as Edmunds, Kelley Blue Book, MSN Autos, and Yahoo Autos, the consensus is more positive than negative. Indeed, the gripes are few. What owners say they like is the roominess and comfort of the redesigned RAV4, as well as the fact that that it sits up high and there's no tire on the back. Many remark about the peppiness of the four-cylinder engine, although a few complain that it could use more "zip," and that gas mileage should be even higher than it is. Other often-mentioned pluses include the standard rearview camera, the Bluetooth, the touch-screen, overall quietness, handling, and easy maneuverability. A few of the owners commented that the non-negotiable price isn't to their liking, the heating system is hard to adjust, the glove compartment doesn't lock, power passenger seats not standard on XLE AWD, and it's tough to remove the storage compartments on the dash and between the front seats. Some noted the lack of an automatic headlight feature while one owned commented that the horn was "wimpy." 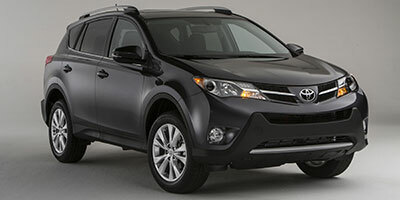 The 2013 Toyota RAV4 lineup is fairly simple, consisting of LE, XLE and Limited trims. But simple doesn't mean stripped, as even the base LE is well-equipped, a point made by most auto critics. Standard features in the LE include power windows, mirrors and remote locks, a rearview camera, cruise control, wireless cellphone link, 6.1-inch touchscreen display, USB port and digital-media player connection. The next trim up is the XLE, which adds 17-inch alloy wheels, a power sunroof, heated mirrors, front seats with extra bolstering and French stitching, and dual-zone automatic climate control. The optional navigation system package also includes satellite radio and Toyota's Entune infotainment system. The top-of-the-line Limited features heated front seats, leather-like vinyl upholstery (instead of cloth seats), leather-trimmed steering wheel, keyless entry and start, eight-way power driver's seat, and a power liftgate. Options with the Limited trim include blind-spot alert with cross-traffic alert, the navigation system package optional on the XLE, and a similar one with a premium JBL audio system. An all-electric RAV4 with the old body style remains for sale in California. RAV4 EV is packed with features like navigation display, dual-zone climate control, and the smartphone-enabled Toyota Entune system. Picking out an engine isn't complicated in the 2013 Toyota RAV4. For both front- and all-wheel drive models, there's only a single powerplant: a 176-horsepower 2.5-liter four-cylinder engine mated with a six-speed automatic transmission. As for the decision to drop the V6, as Edmunds pointed out, "Toyota realized that the RAV4 didn't need to be faster than just about every other vehicle in its lineup." Eco and Sport. Eco provides for more efficient driving by adjusting shift points and throttle response, while Sport delivers a more enjoyable driving experience with faster throttle response, longer gear holding, keeping the transmission in a lower gear for a given road speed, and adding a bit more weighty feel to the crossover's steering. EPA-estimated fuel economy for front-drive models is 24 mpg city/31 mpg highway/26 mpg combined. All-wheel drive RAV4 models achieve EPA-estimated fuel economy of 22/29/25 mpg. As for the 2013 Toyota RAV4 EV, the powerplant is a 114-kW electric motor that produces the equivalent of 154 horsepower and 273 pound-feet of torque (in Sport mode) and 281 pound-feet of torque (in Normal mode). There is only a single-speed transmission. All-wheel drive is not available. As for EPA ratings, the 2013 RAV4 EV gets 78 mpg city/74 mpg highway/76 mpg combined in miles-per-gallon equivalent (MPGe). Most auto critics note that this isn't exactly great by EV standards, and other competitors' EVs are more energy efficient, such as the Ford Focus Electric, Nissan Leaf and Honda Fit EV. Living with the 2013 Toyota RAV4 means spending some time getting acquainted with the compact crossover's interior. Most of the motoring press has positive comments about the improvements that Toyota made with the redesign of the RAV4. In particular, some of praise is on the crossover's ergonomics, how easy it is to get in and out of the vehicle, the overall space and room, the visibility, and the cargo and storage capacity. The cabin's new interior design has some elements that it shares with the midsize Camry and full-size Avalon sedans. Reviewers find the lines clean and uncluttered, and comment that the quality has been much improved in the redesigned RAV4. In fact, some of the materials used are even nicer than those in the Camry. For those families who count cupholders as important, the RAV4's are adequate. Storage slots, however, aren't as plentiful as in the Honda CR-V, one of the RAV4's competitors. One of the RAV4's key strengths is its cargo capacity. The cargo bay is 38.4 cubic feet and expands to a generous 73.3 cubic feet when the second row is folded. This makes the storage capacity in RAV4 one of the largest in the class of compact crossovers. In addition, as most auto critics point out, the almost-flat rear load floor is quite low, making loading and unloading a less strenuous process. Toyota paid a great deal of attention to the safety equipment in the 2013 RAV4. As noted by many auto reviewers, standard safety features include a full complement of eight airbags, with the inclusion of a driver knee airbag, whiplash-reducing front head restraints, antilock disc brakes, stability and traction control. There's also a standard rearview camera. But the blind-spot alert with cross-traffic alert is only optional on the Limited trim. In government crash testing by the National Highway Traffic Safety Administration (NHTSA), the 2013 Toyota RAV4 received four stars for overall crash protection, four stars each for frontal and rollover testing and five stars for side impact protection. The 2013 Toyota RAV4 EV was not rated by the NHTSA. The Insurance Institute for Highway Safety (IIHS) gave the RAV4 the highest possible rating of "Good" for the trio of frontal-offset, side and roof strength tests, naming it a Top Safety Pick. The IIHS did not conduct small overlap front tests on the 2013 RAV4. As for reliability, the 2013 Toyota RAV4 has a four and one-half Power Circle score in the J.D. Power Predicted Reliability rating. This means the RAV4 is between "among the best" and "better than most" in terms of reliability. Interested to see how the 2013 Toyota RAV4 ranks against similar cars in terms of key attributes? Here are the 2013 Toyota RAV4 rankings for MPG, horsepower, torque, leg room, head room, shoulder room, hip room and so forth.